San Mateo eNews - Happy Holidays! In observance of the holidays, most non-essential City facilities will be closed on Christmas Eve, Christmas Day, New Year’s Eve and New Year’s Day. Emergency and other essential services will continue. City Hall: closed Christmas Eve and Christmas Day, New Year’s Eve and New Year’s Day. 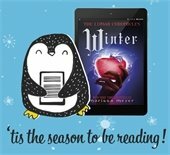 Libraries: All branches will be closed on Christmas Eve and Christmas. Libraries will close at 5 p.m. on New Year’s Eve and be closed New Year’s Day. Parks and Recreation: All recreation centers and the Japanese Garden in Central Park are closed Christmas and New Year’s Day. 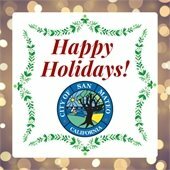 Most recreation centers are also closed Christmas Eve and New Year’s Eve, with the exception of the King Center, which is open from 9 a.m. to 3 p.m.
From everyone at the City of San Mateo, we hope you have a safe and festive holiday season! Are you traveling for the holidays? Let the San Mateo Public Library help you pack light! Save valuable space in your bag by renting an eBook, audiobook or eMagazine. You can also download the Peninsula Library System’s mobile app Libby to download digital content on the go! Join our dedicated San Mateo firefighters in helping to brighten the spirits of local families this holiday season. 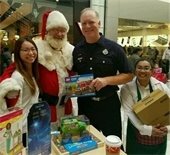 The San Mateo Firefighters Association’s annual toy drive is in full swing and needs your help to make sure no child in your community goes without a gift this holiday season! You can donate by visiting their webpage or meeting them at the Hillsdale Shopping Center where firefighters have a donation booth set up from noon to 8 p.m. on the first floor near the Apple Store every day through Dec. 23. Your donation of any unwrapped toys, gift cards or monetary support is greatly appreciated by the firefighters and the families they support. With the holidays in full swing, you probably have a majority of your shopping done. But that doesn’t mean you need to be lax now. San Mateo Police are increasing enforcement efforts to deter burglars and ask community members to help protect themselves. For more information visit the Police Department’s Crime Prevention and Safety Tips page. Clear your library fines while providing food to those in need. 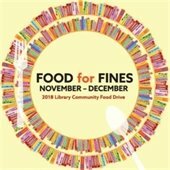 Through the end of the year, the Library will waive your overdue fines in exchange for a donation of a non-perishable food item. You can drop off donations at the Main Library, Hillsdale Library or Marina Library through December 31. All of the food collected will be donated to the Second Harvest Food Bank. The City’s new Solid Waste Container Ordinance goes into effect on December 20 and enforcement will begin after January 1. 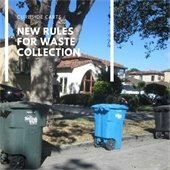 The new rules provide a 36-hour timeframe of when waste containers may be left out on residential streets. Residential waste containers may not be placed on the curb prior to noon the day before collection service and must be removed by midnight the day of pick up. For Downtown San Mateo – defined as the area zoned as Central Business District or Central Business District Support – all solid waste containers cannot go to the curb before 6 p.m. the day prior to service and must be removed by 11 a.m. the day of service. Did you know there’s a special holiday solid waste collection schedule? There is no collection on Christmas or New Year’s Day and some Recology customers may have their pick up delayed a day. Visit RethinkWaste’s calendar for more information. We are proud to be the first City in San Mateo County to adopt a $15 per hour minimum wage to help working households achieve economic security given the high cost of living in our community. 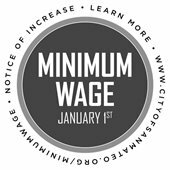 Starting on January 1, 2019, the minimum wage in the City of San Mateo will increase to $15 per hour for all businesses, with the exception of nonprofits whose wages will be $13.50 per hour. This wage applies to all employees working more than 2 hours per week within the City boundaries. For more information, visit our Minimum Wage web page. Do you remember when San Mateo voters approved Measure S in 2015? That quarter-cent sales tax extension supports community-identified priorities like fixing streets. 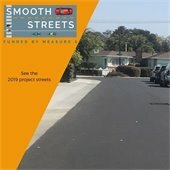 In 2018, the City of San Mateo’s Smooth Streets program completed 26 street rehabilitation projects. Ten more street segments have been identified for fixing in 2019. Is yours one of them? Visit the Smooth Streets interactive map portal for more details. 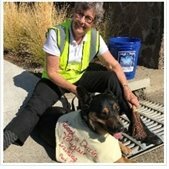 It was a tough decision, but we’re pleased to announce the winners of our Adopt-a-Drain photo contest! Congratulations to all of the participants and especially the six winners whose Me and My Drain photos stood out. Entries from these community-minded volunteers ranged from Girl Scout troops to canine companions. Participation during the two-month contest led to 32 new volunteers and 60 new storm drains being adopted! The volunteer program is a great way to support your neighborhood by helping to deter flooding and prevent pollution from entering our environmentally-sensitive waterways. Bicylists - It's Not Too Late to Get Involved! Did you miss the recent Bicycle Master Plan update meetings? 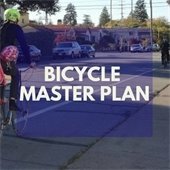 The Public Works Department has begun updating the 2011 Bicycle Master Plan with an aim to make the City of San Mateo a great place to bike. Even if you missed the meetings, you can still share your thoughts, complete our quick survey and add your favorite bike paths (or create a new one) to our WikiMap. We want to hear from you!